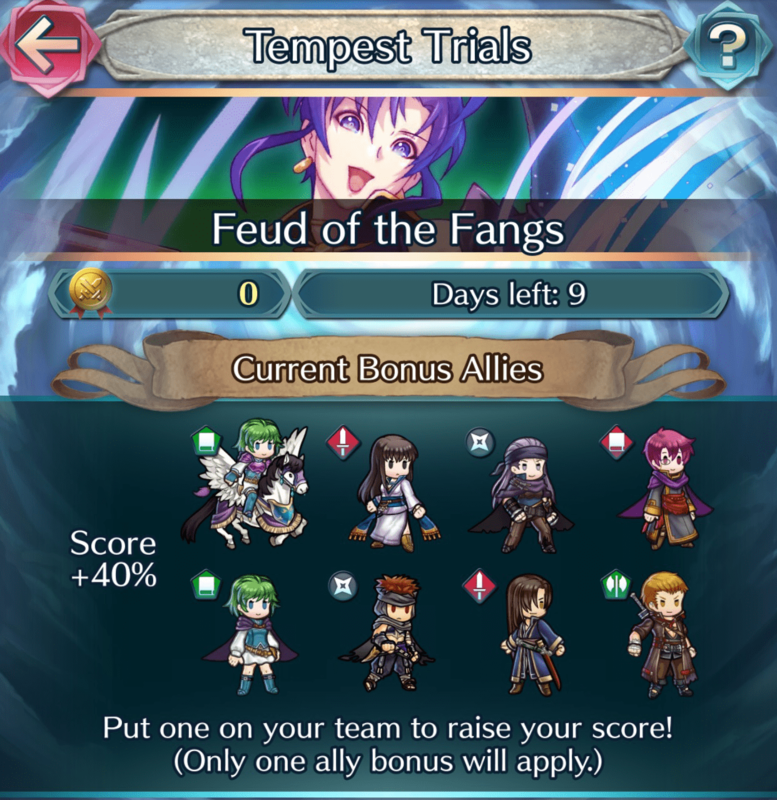 You can earn triple the score twice per day in Tempest Trials! That’s an offer that’s too good to miss! Wow! You’re really excited about this, aren’t you? Ha ha! Who wouldn’t get excited by a triple-point deal? No self-respecting merchant would pass that up! Well, you’ve convinced me, Commander—I think the excitement is spreading! Why, I’m just raring to go! I think I might know why—during the triple-point period, you get a boost to your stats as well! And that’s just perfect for a good, long Tempest Trials session, wouldn’t you say? Let’s go! W-wait! Wait, the pair of you! Don’t forget that you only get the boost twice per day! …Oh, fiddlesticks. 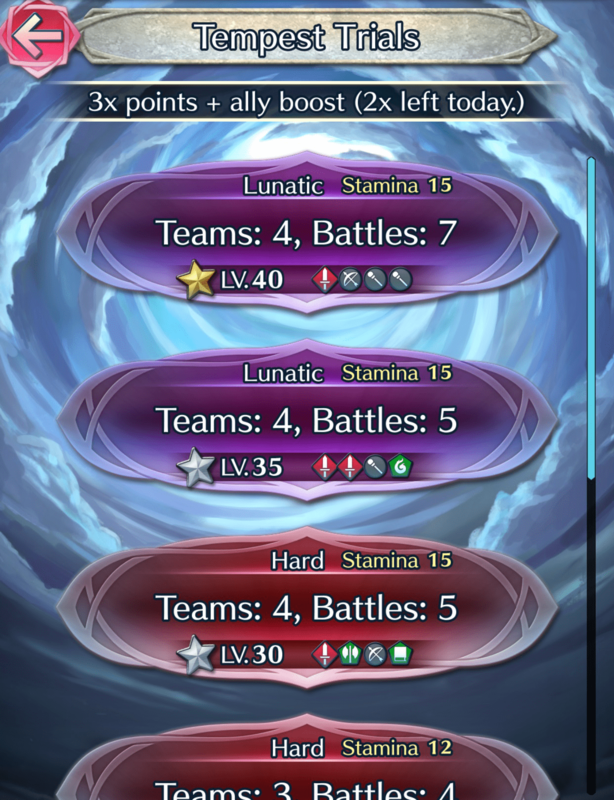 Tempest Trials consists of a series of battles taking place over several maps. Let’s go over some efficient ways to earn points in this mode. Every event has a set of bonus allies that will receive a boost to their stats and increase your score by 40%. Naturally, you’ll want to include these allies in your team! What’s more, there’s an additional bonus that you can receive twice per day. It will triple the score you earn and boost the stats of all your allies. Five in a Row Is the Way to Go! While you’ll get the most points from playing on the Lunatic/LV.40/7 battles setting, it’ll be far from easy. It’s a good idea to save the stat and point bonuses you receive twice per day for this, and once you’ve used up the bonuses, keep playing on the Lunatic/LV.35/5 battles setting or the Hard/LV.30/5 battles setting. Make Sure You’re Well Prepared for the Boss! The foes you’ll encounter are chosen randomly, but each final stage has a predetermined boss. Make your forays easier by building a team that can take the boss on effectively.